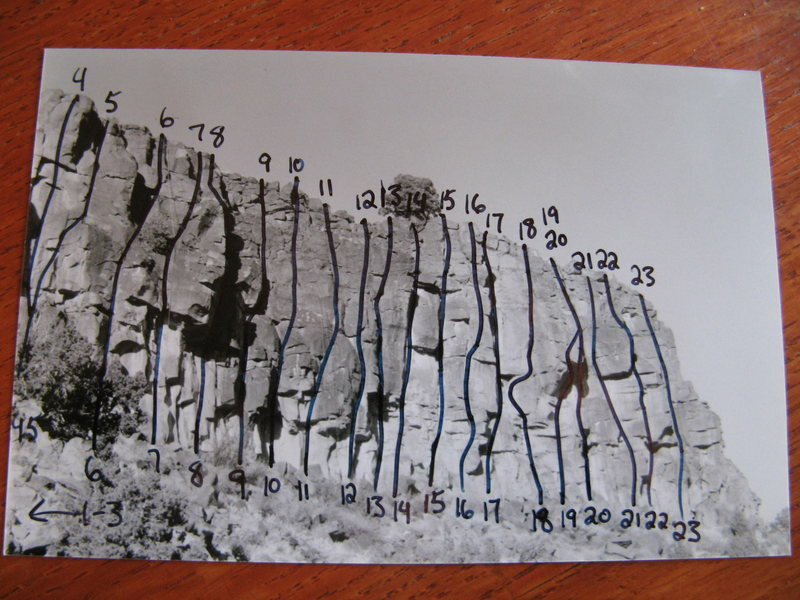 This climb is about 10' right of "#22"; it is the rightmost line on the South Side of the Big Enchilada that looks worth considering. Informally called "Three Sisters" because of 3 distinct routes that can be done from the anchors. You can also do at least 3 different routes to get to the ledge, the left one being the best for pro. For the left route, ~5.8+, climb up a blocky dihedral to a ledge. Climb the headwall above, following the crack in its center that begins as hands, passes over a block, then turns to a finger crack. Finish on easy slab to an anchor on the blocks at the top. Good gear lead. The middle route follows the left side of the face to the right, using the nose/arête, and has a short 5.10- crux. Best to top rope. The right route follows the next crack to the right, off the rope line, goes at ~5.8, and makes a nice easier lead. Takes gear up to #4 Camalot. This climb is also listed as Beverly #25 (5.9+) and Jackson #8 (5.9+). Standard rack up to 3 inches. 2-bolt anchor, reachable from the top. Use long slings to extend.